The question Do we know at which angle the Event Horizon Telescope will look at the accretion disk of Sagittarius A*? about just how close to edge-on we would be viewing any accretion disk around the black hole in the center of our galaxy, and @Zephyr's excellent answer have got be thinking about the geometry and angular momentum. While the angular momentum vector of a black hole will likely reflect that of all the matter that fell into it , would the plane of any accretion disk around a black hole reflect the black hole's current equatorial plane, or a plane defined by rotation of whatever material is currently falling in to it? Another way to formulate this question might be to propose an incredibly unlikely Gedankenexperiment. If I inserted a black hole into the center of a rotating disk of material so that the black hole's axis was in the plane of the disk of material rather than parallel to its rotational axis, would a well-defined accretion disk form all all, and if so, what would determine the orientation of that plane? The initial accretion disk movement is defined by the objects falling into it, the black hole's mass and its spin of course. If you take the situation where a single star falls on a quiet black-hole, the accretion will appear along the orbit of the infalling object. Not the answer you're looking for? Browse other questions tagged black-hole supermassive-black-hole accretion-discs or ask your own question. 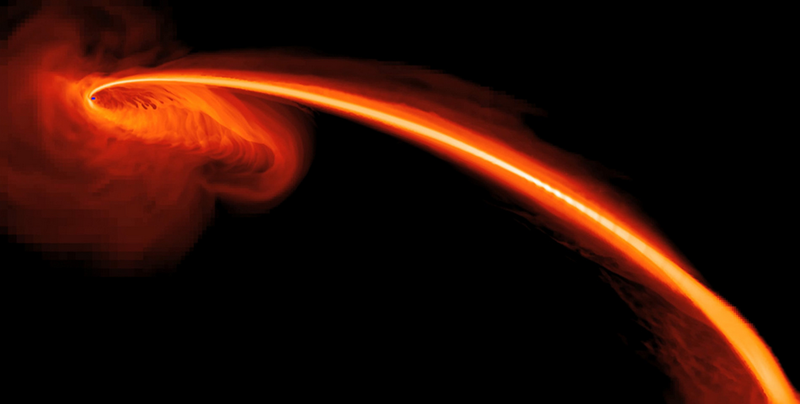 Do we know at which angle the Event Horizon Telescope will look at the accretion disk of Sagittarius A*? Accretion disks - why are they disk-shaped, rather than spherical? Does the dust around SMBH's protect habitable planets from jets? How does a black hole spin?